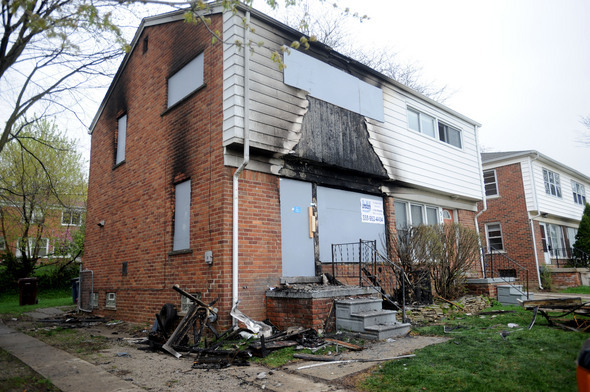 A home on West Stadium Boulevard in Ann Arbor is boarded up after fire caused extensive damage early Tuesday morning. Fire caused extensive damage to a home on West Stadium Boulevard in Ann Arbor early this morning and sent one firefighter to the hospital with minor injuries. Firefighters were called to a home in the 500 block of West Stadium Boulevard at 1:41 a.m., a press release said. They could see flames and smoke coming from the home while en route and arrived to find heavy flames on the first floor, extending to the second floor. Crews began attacking the fire while other firefighters searched for the residents, who firefighters later discovered had escaped before their arrival, the press release said. The fire was under control by about 2 a.m. A firefighter who suffered a hand injury was taken to St. Joseph Mercy Hospital in Superior Township for treatment, Battalion Chief Robert Vogel said. The home, which is one unit of a duplex, was declared a total loss. The adjacent unit had smoke and water damage, Vogel said. The fire's cause has not been determined. The Washtenaw County Red Cross said it was providing food, clothing and shelter to residents. Vogel said three people were living in the home.